(a) Visually check if the cap and gasket are deformed or damaged. (b) Check charcoal canister operation. (c) Check the air tightness. (e) Check pump module operation. 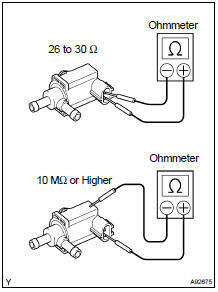 If the result is not as specified, replace the pump module. (a) Measure the VSV resistance between the terminals.